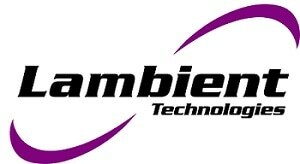 Release films reduce the chances of parts adhering to a tool in composite manufacturing. Vacuum Assisted Resin Transfer Molding (VARTM) utilizes vacuum bags to ensure that atmospheric pressure can compress a composite against the mold. Dielectric sensors often need to have fixed contact with the material during testing. By defending against contact, release films and vacuum bags can be difficult to use for the purpose of dielectric cure monitoring (DEA). However, a sensor created with these challenges in mind can analyze cure state through thin films, allowing for DEA to be utilized in a more varied range of applications. Both release films and vacuum bags are created using PTFE or various plastics, and can insulate electricity. This means that they can be impacted by AC measurements, but they defend against DC signals. In this article, the tests compare AC and DC cure monitoring by way of a release film with the 1-inch Single Electrode Sensor. This article illustrates and examines the data for log (ion viscosity) and slope of log(ion viscosity), which both show the state of cure. The plots describe the definable characteristics, for example, the time to a chosen end of cure, maximum slope of log (ion viscosity), and minimum ion viscosity. For concision, log(ion viscosity) will be referred to as log (IV), and the slope of log (ion viscosity) will just be referred to as slope. Electrical conductivity (σ) contains two different components that are frequency independent (σDC) and frequency dependent (σAC). Resistivity, due to its relationship to conductivity, also has two components which are frequency independent (ρDC) and frequency dependent (ρAC). ρDC is influenced by both the movement of ions and mechanic viscosity, which are defined by the amount of crosslink density or polymerization, and are ways to measure cure state. While the more accurate definition of ion viscosity is frequency independent resistivity (ρDC), in simpler terms, ion viscosity can also be utilized as a term for resistivity as a whole, which has both frequency independent (ρDC) and frequency dependent (ρAC) components. 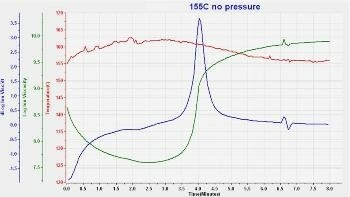 It is important to note that mechanical viscosity and cure state are related more accurately to frequency independent resistivity (ρDC), also known as true ion viscosity. Figure 39-1 illustrates how a reusable 1-inch Single Electrode Sensor can be installed in a press or mold. In order to ensure smooth operation, the Single Electrode Sensor tools need to be grounded. The ground must be fixed to the chassis of the instrumentation, as described schematically in Figure 39-2), to design a closed circuit for the sensing current. Where an upper platen or mold is also included, this should also be grounded. In applications which do not utilize a release film or a vacuum bag, the resin transports during compression and heating, and then makes direct contact with the sensor. Figure 39-3 illustrates the electrical model of the resin-sensor system. Ion viscosity, also known as frequency independent electrical resistivity, corresponds to cure state, and is the factor that is most beneficial for dielectric cure monitoring. Figure 39-4 presents ion viscosity under the effect of a 130 °C cure of bulk molding compound (known as BMC). The BMC was in direct contact with the 1 inch Single Electrode Sensor, along with a Lambient Technologies LT-451 Dielectric Cure Monitor under 100 Hz excitation. The response is aligned with the normal behaviour for thermosets. The resin’s mechanical viscosity and ion viscosity lessens as the temperature becomes greater. The material is at the least amount of mechanical and ion viscosity until the curing reaction takes hold, and then mechanical and ion viscosity become greater. In the gelation stage, mechanical viscosity becomes higher in a quick manner until it can no longer be measured. Once gelation has finished, ion viscosity separates from mechanical viscosity, and frequently corresponds with modulus until the end of cure. As gelation is a mechanical event rather than electrical, no dielectric characteristic shows the gel stage. Ion viscosity becomes higher even after the gelation stage, which allows for the continuous measurement of material state until the end of cure. When the reaction comes to a close, the ion viscosity curve flattens and the slope becomes zero. In theory, end of cure is a slope that can be defined by the user depending on the needs of the application. Once the end of cure has been measured, dielectric cure monitoring equipment can give off a signal to automatically open a press or a mold. Figure 39-5 demonstrates a dielectric sensor in a mold containing release films. Once the mold has been closed, the applied pressure enables close contact between the sensor and the release film, and equally between the release film and the composite material. Figure 39-6 illustrates a dielectric sensor located for cure monitoring of a material within a vacuum bag. When the vacuum is pulled, the bag becomes in close contact with the composite, which makes dielectric measurements possible. Figure 39-7 is a representative sample of these compositions with a release film or vacuum bag. This supports how the electric field emitted from the sensor’s electrode transports through an insulating layer into the composite, and reaches the mold. Figure 39-8 is an electrical model of the composite-insulator-sensor system. 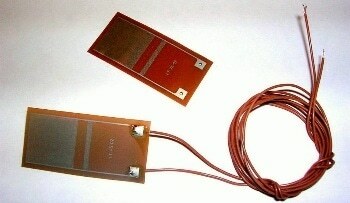 The insulator offers a pair of capacitors in series between the Material Under Test (MUT) and the electrodes. The capacitors perform as boundary layers, which is an additional factor not included in the model of Figure 39-3. As capacitors only pass AC signals, cure monitoring is impossible under DC methods. Where the Material Under Test (MUT) is highly conductive, particularly at the stage of minimum viscosity, the existence of boundary layers can alter measurements of ion viscosity. Figure 39-9 displays the 1 inch Single Electrode Sensor shielded with HTF-621, which is a release film created with PTFE from Northern Composites. The HTF-621 layer is just 0.001 inches in thickness, and is non conductive and chemically inert. Figure 39-10 is a comparison of ion viscosity, both with and without a release film during the 130 °C cure of BMC. The curves are considerably equal apart from at the stage of least ion viscosity when the boundary layer impacts measurements through the release film. In several instances, it is possible to mathematically correct this deformity and retrieve information about the cure. Figure 39-11 demonstrates how the correction of the boundary layer, a process also known as electrode polarization (EP) correction, restores the impacted data. After EP correction has taken place, ion viscosity analyzed with the release film accurately follows ion viscosity measured without the presence of a release film. The small variances between curves are mostly because of the differences in temperature of the two tests. The change of ion viscosity is because of the cure of the resin solely. This transformation shows beneficial information when using Critical Points to define the ion viscosity curve. Figure 39-12 and 39-13 both support the coherence between Critical Points found by sensors, both with and without the use of a release film. Critical Point 1 (CP(1)) is viscosity level determined by the user at the beginning of the cure. When the ion viscosity abruptly goes below this level, CP(1) tells the user that the resin or flow front is in contact with the sensor. Critical Point 2 (CP(2)) is the minimum ion viscosity, demonstrating the time of minimum mechanical viscosity. Critical Point 3 (CP(3)) is the point of inflection of the ion viscosity curve, or the stage of maximum slope and the time where the reaction rate is at its greatest point. Even though CP(3) is not the gel point, it is often referred to as the gel point. Critical Point 4 (CP(4)) can be defined by the user as a slope to show the end of cure. It is important to note that the slope for CP(4) was selected promptly to show how to determine the end of cure. More accurately, the user can choose a slope to greater benefit their particular application requirements. As AC measurements through a release film are associated with the cure state, Figure 39-13 supports that the appropriate slope allows for the trustworthy discovery of the end of cure. More frequently, release films of a high temperature tend to be created from PTFE and other non-conductive materials. Because of this, they perform in a similar respect to the capacitive blocking layers as shown in Figure 39-8, and can make the transportation of DC signals difficult. Even though several low-grade release films are conductive, this can change depending on the temperature and can vary in consistency from batch to batch. While it is not impossible to carry out DC measurements using these films, the results combine the resistivity of the film and the material under test in an unpredictable manner. Moreover, the data can be untrustworthy because of variations in temperature. 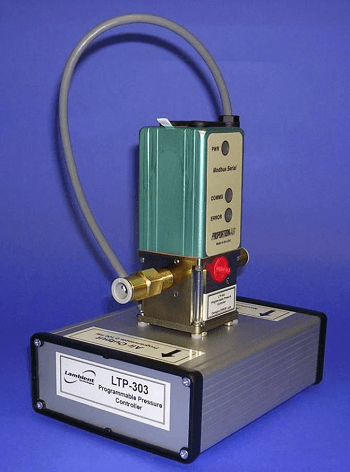 The LT-451 Dielectric Cure Monitor has an option for DC measurement, which was utilized with the single electrode sensor to measure BMC cure at 130 °C. Figure 39-14 is a comparison of results with no release film, with the HTF-621 release film, and with a conductive release film. To create a reference point, the data from 100 Hz AC measurements has also been plotted. When the end of cure is in reach, AC and DC measurements that do not have a release film are equal in results. Although, DC measurements without a release film are impacted by distortion when electrode polarization takes place near the time of the ion viscosity minimum. While it is possible to refine this distortion with the use of AC data (see Figure 39-11), it is impossible to correct DC data. DC measurements using the conductive release film are possible, but can still be impacted by distortion because of electrode polarization. During the end of cure, the conductivity of the release film dominates and lessens the ability to easily detect the cure state. DC measurements through the non-conductive HTF-621 release film are impossible, which is demonstrated by high and essentially constant ion viscosity at the measurement limit under this environment. With the use of the correct sensor, AC measurements using a release film or vacuum bag can measure cure, along with a sensor that is in direct contact with the material under test. The release film can make ion viscosity data variable around the viscosity minimum stage when the material is at its most conductive. However, in many cases, software can mathematically refine the distortion to make it more accurate. However, DC measurements are impossible through a release film, and are a critical weakness of DC cure monitoring methods.